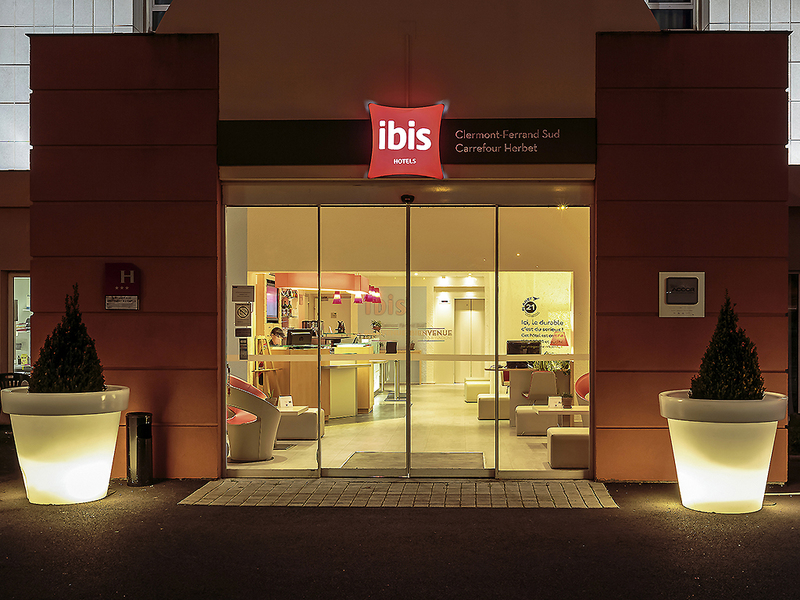 The ibis Clermont Ferrand Sud - Carrefour Herbet hotel is ideally located 1.7 miles (2.74 km) from the city center, right next to the highways, the Brézet and Pardieu business centers, the Polydôme convention center, the SNCF train station, the Grande Hal le d'Auvergne, the Zénith and Vulcania. The entirely non-smoking hotel offers 70 air-conditioned rooms with a large bed or twin beds, with free WIFI.Two meeting rooms, a free private car park and a restaurant and bar serving snacks round-the-clock. Discover the treasures of Roman art and the Parc des Volcans d'Auvergne, Vulcania, Gergovie. I'll certainly plan on staying here before early morning flights back to Paris. The rooms are comfortable and well equipped. The staff is very professional, yet warm and friendly. They are so helpful. Have stayed here before. Well situated for us as an overnight stop en route south. Plenty of free parking. The team very friendly and helpful. The rooms and shower/toilet a bit &quot;snug&quot; but for overnight perfectly clean and acceptable. No restaurants nearby but the hotel restaurant is fine. Breakfast is good with a wide choice of products. Happy to stay again. Staff were really good but accommodation was very cramped especially the tiny bathroom. Not too pleased at being moved from a quiet room at the back of the hotel to one overlooking the main road. The reason was a group of Italian tourists on the same floor but why that meant being moved from the back of the hotel to the front was not made clear. Very dreary. The room was overpriced, bare, the tiny bathroom smelt of stagnant water, the air conditioning very weak. tv broke down. no bbc or any other english language programmes despite being advertised on the material in the room. My expectations were fulfilled. Clean room, no noise, convenient location and parking, friendly and helpful staff. The dinner was not available in the restaurant, though it's not a problem as there are several options nearby. Things which can be better: not a big selection for breakfast and tiny bathroom. Not a big problem though. I phoned before and asked if there was a restaurant available on site. YES. I WAS TOLD.Having driven for 12 hours. I was told on arrival it was closed. I am one of the Press Officers for the Caravan Club in UK. I will ensure our million members know of this. Clean. comfortable, friendly and efficient. A hassle free overnight stop with welcoming friendly staff and a clean and comfortable room. The person looking after the breakfast was friendly, helpful and efficient. Clean rooms and quiet despite being near major roads. Stayed in unusually warm week in October when temperatures went above 25 degrees C. The room was too hot for comfort at night and there was no air conditioning available. Not sure if this was a technical issue or a management decision not to allow use of air conditioning in October. Used the restaurant once in the evening and pleasantly surprised by the quality.